Add to the mounting accolades of the totally refreshed 2013 Ram 1500 with its selection as Four Wheeler Magazine's Pickup Truck of the Year. It is little wonder the editor’s so designated the Ram1500, thanks to the bevy of class leading features and specifications it boasts. The 3.6-liter Pentastar V-6 engine (also named to Ward’s 10 Best Engines) produces the spirited force of 42 percent more horses, 13 percent greater pulling power while using 20 percent less fuel than the previous 3.7-liter V-6. Still well powered, the models running on this engine get up to 25-mpg in a full size pickup – brilliant. The optional 5.7-liter HEMI V-8 brings 395 horsepower to the job at hand while Fuel Saver Technology and variable-valve timing develop 407 lb.-ft. of torque while continuing to get best-in-class fuel economy for a V-8 truck, even outperforming some competing V-6 turbocharged engines. "Our readers use their trucks, sometimes in much harsher duty cycles than most would expect," said John Cappa, Editor – Four Wheeler Magazine. "Within our testing, we integrate a number of challenges to push capability and durability. 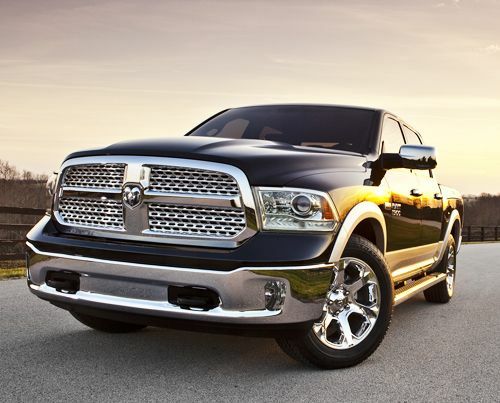 At trails-end, the 2013 Ram 1500 was our choice and winner of Four Wheeler Magazine's Pickup Truck of the Year." The fact the Ram 1500 has segment leading fuel economy, a new eight-speed automatic transmission, stop-start and active aerodynamics that include grille shutters and load-leveling air suspension likely influence their decision. The manner in which these features improve ride control and off-road capability probably had a lot to do with it as well. "Pickup Truck of the Year from Four Wheeler Magazine recognizes the engineering efforts put forth to mold the new 2013 Ram 1500 and we're honored to carry the title," said Fred Diaz, President and CEO Ram Truck Brand and Chrysler de Mexico, Chrysler Group LLC. "A large percentage of our customers are outdoor enthusiasts, making this award very well-received in a fiercely competitive truck market." The selection process takes five days across 1,000 miles providing the seven judges a chance to pit the pickups against every condition an owner is likely to encounter, from city gridlock to black diamond offroad trails. Judges ratings are based on the vehicle's performance, comfort and design. As Ram Truck continues to establish its separate identity, the Ram 1500 was completely re-engineered from the ground up. Consequently it may well be the most recognizable pickup on the road today. It comes in nine trim levels starting at $23,585 with destination charges included. This is just one more feather in the highly festooned hat of the Ram 1500 – and one it well deserves. Calling All Farmers, Ram is Producing Trucks Designed Just for You!